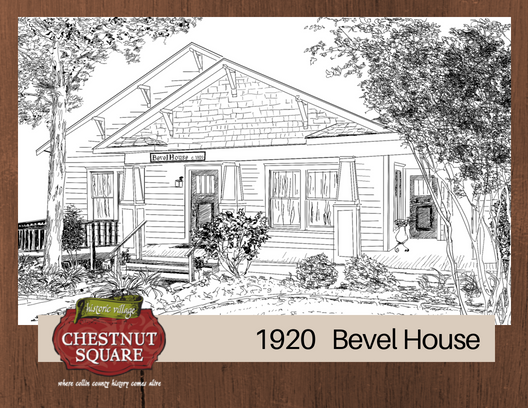 A visit to Chestnut Square is like stepping through a looking glass into the past…a bygone era when craftsmanship, hard work and simple pleasures were the bedrock of life. 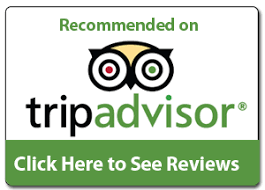 The grounds and buildings are beautifully maintained — no small feat, given the costs to keep it all pristine. 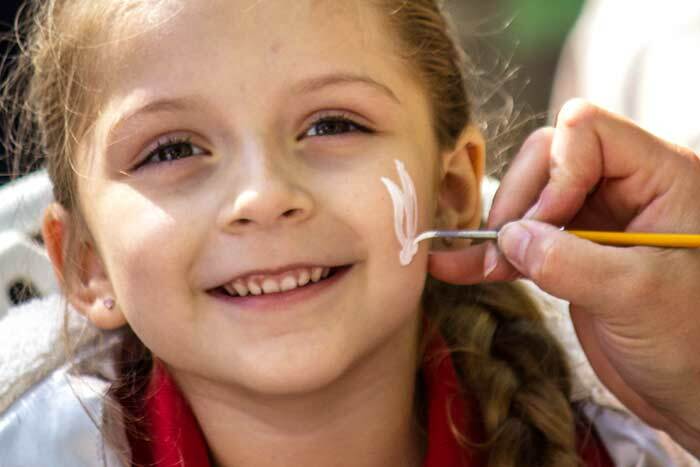 It’s a special place to which all parents with children today should bring them for a few hours, to give them a real sense for history of everyday life among their ancestors. 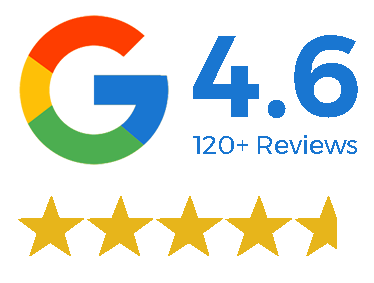 You’ll love the people who make all this possible…they’re very knowledgeable of the history, and eager to impart the secrets of life in a simpler time. We attended a small country wedding this past weekend at the Chestnut Square Historic Village. It’s a series of small cottages used for different venues. The chapel held about 100 guests with wooden pews. 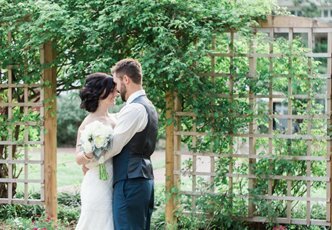 The reception was held in another cottage that catered BBQ and outdoor dance area under covered patio with disc jockey. Amble parking nearby. The staff was friendly and the event was fun to attend. If I lived in this city and would like to renew our vows, I’d consider this location. Where Collin County History Comes Alive! 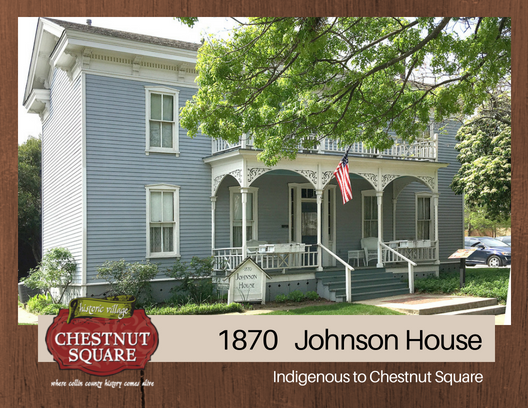 Step back in time with a visit to Chestnut Square Historic Village. 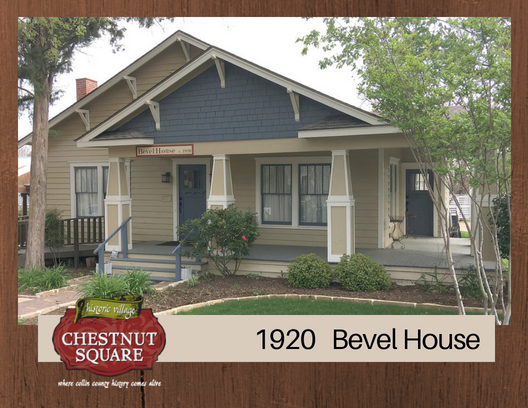 Sitting on 2.5 shaded acres just two blocks south of the historic downtown McKinney square, Chestnut Square provides an opportunity to step back in time and regain a sense of community. 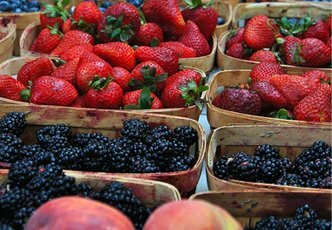 With ten structures dating from 1854 to 1930, the Village offers docent led tours, facility rentals, a wedding venue, living history demonstrations and community events like the #1 Farmers Market in Texas and the Killis Melton Ice Cream Crank-Off. 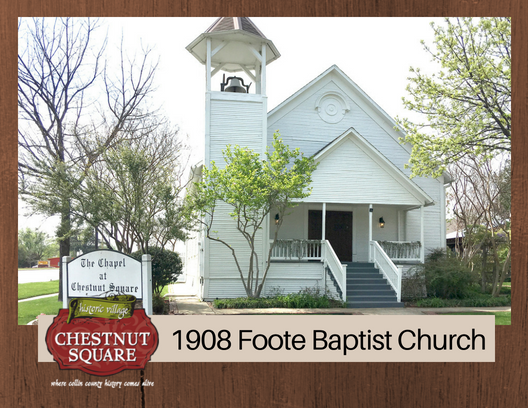 Chestnut Square holds community oriented events that bring people together to enjoy McKinney and Collin County’s heritage. 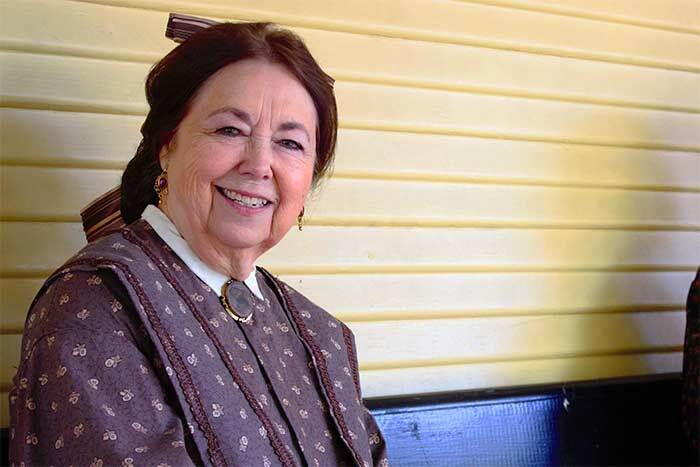 Chestnut Square brings history and heritage of Collin County to life in the most fun and interactive ways possible. 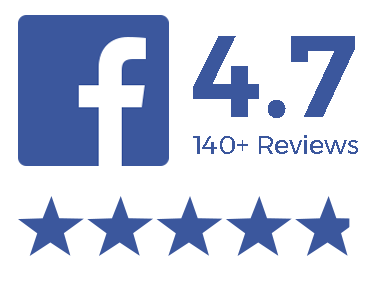 Everyone can play a part in the success of Chestnut Square. Our volunteers are the heart of the Village. 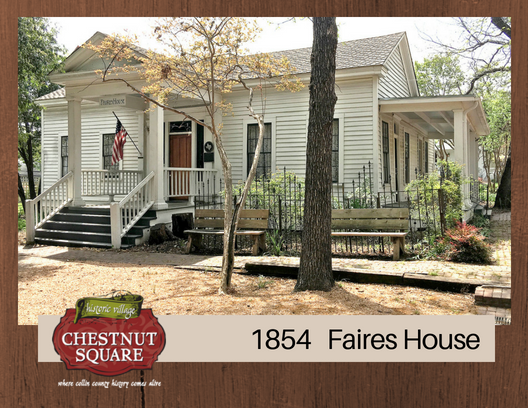 Known as the Oldest House in McKinney, the Greek Revival Faires residence was built on Tennessee Street. Mr. Faires, a blacksmith by trade, came to Texas from Tennessee. 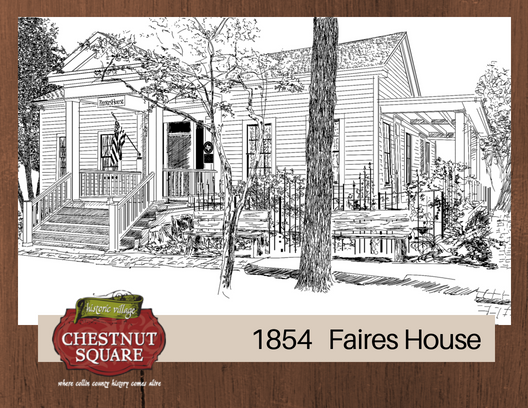 The “dog trot” style house boasts the original front door made by Mr. Faires himself. When the home was moved to Chestnut Square, 2 civil war era bullets were bullets were discovered lodged in the foundation posts. 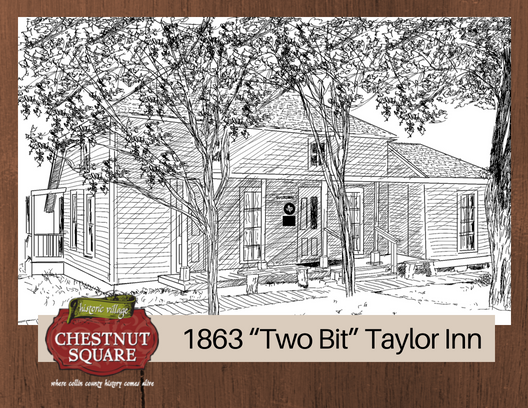 The Armsted Taylor house was purchased for $340 in 1868. Located on Chestnut Street near the “Jockey Lot”, drummers (salesmen) were given a bed for the night, a hot breakfast and had their clothes laundered for 25 Cents (2 bits). 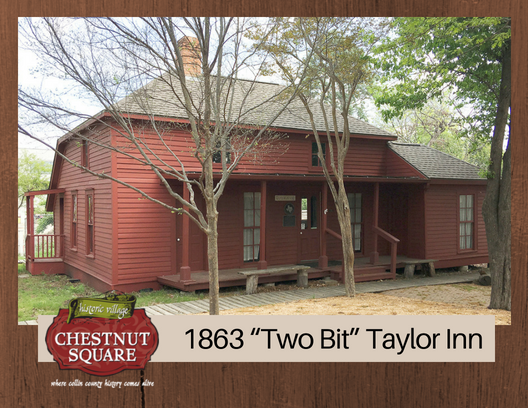 The Taylor’s adult daughter Jennie had her own separate quarters, where she lived and conducted her sewing business. 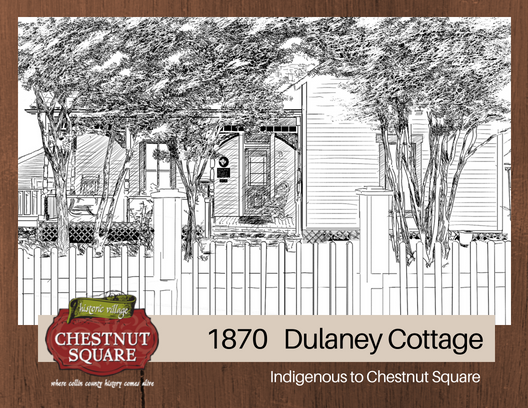 The Cottage, home to Dr. Joseph and Lucy Ann Field Dulaney, originally sat on the corner of Chestnut and Anthony Streets. 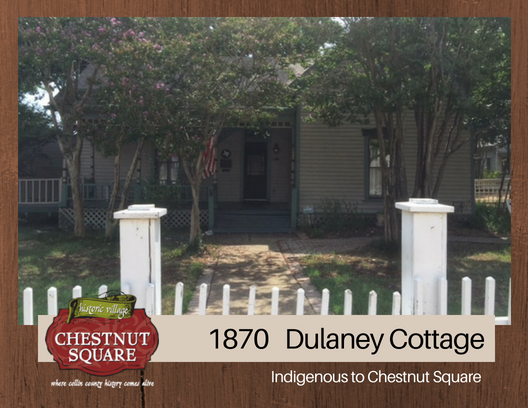 Dr. Dulaney was a Civil War surgeon who practiced medicine in McKinney and in Tennessee, his home state. Dr. Dulaney left Lucy with 3 small children when he died of pneumonia in 1877, one of whom also died of pneumonia, in 1883. 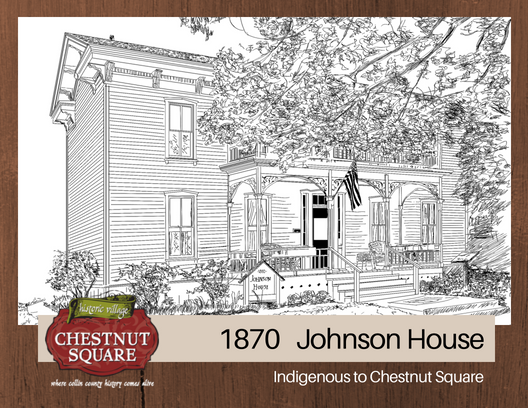 Captain John Johnson bought this Victorian home with Italianate trims in 1878, where he and Polly raised 13 children. Captain Johnson served as a State Senator and legislator. His great nephew and McKinneyite Bobby Younger was a WWII hero whose plane was shot down in 1944. A room in the house displays a tribute to Bobby’s service. In 2015 a crash site was discovered, and Bobby’s remains were identified along with most of his crew. On June 27, 2018 they were laid to rest in Arlington National Cemetery and memorialized at McKinney’s Veterans Park. 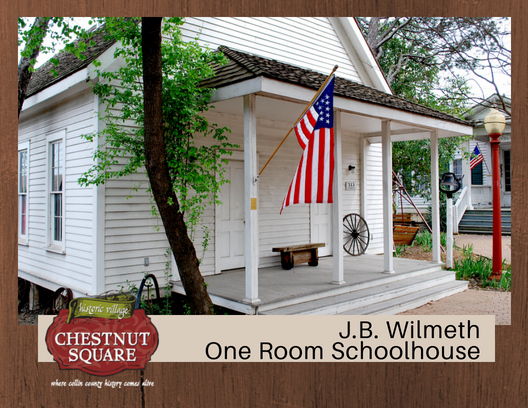 A reproduction of the 1892 one room schoolhouse, the building features separate front doors for girls and boys. Children typically went to school twice a day, breaking to go home for farm chores. 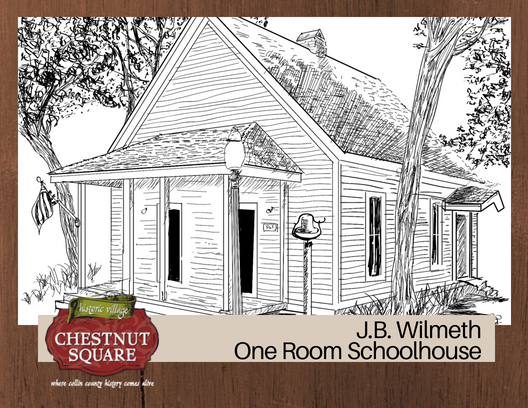 The Wilmeths operated the first free school in McKinney, first in their home and then in the schoolhouse until 1922. 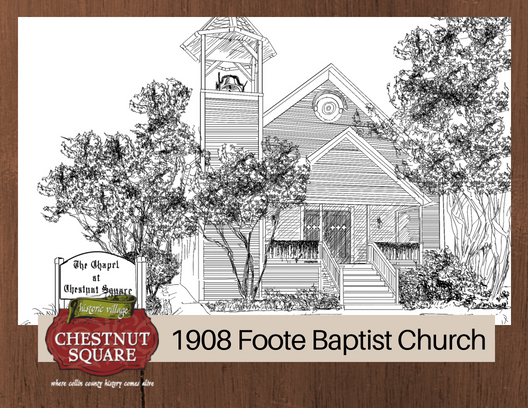 A turn of the century white clapboard chapel, the church was moved to Chestnut Square from Proper, TX, a community near the current Virginia Parkway and Stonebridge Drive intersection, in 1994. The transport began at 4:30 in the morning and took 14 hours to accomplish. 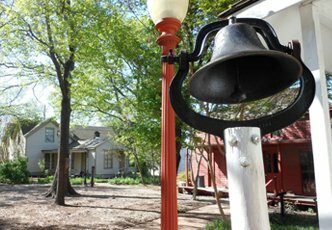 The Chapel boasts the original bell in the bell tower, and holds 150 guests for a wedding, memorial, or church service. Built by John Field for his widowed sister Lucy Field Dulaney and her 2 children, this stately Prairie style home was built at the corner of Chestnut and Anthony Street, after the “cottage” was moved to the less prestigious lot next door. The widowed Mr. Field planned to live with Lucy, his niece and nephew, however he died just a month before the house was complete. 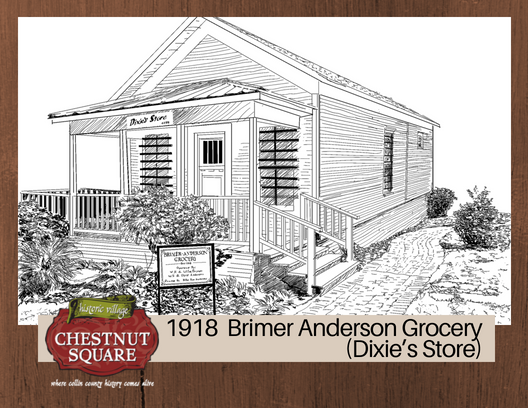 Originally on Lee Street near Howell and Graves Streets, Mr. Brimer served local farmers by filling their orders while they did other business in town. His store was also known as a place to catch up on local news (gossip). When his daughter Dixie took over the store, she treated children with good report cards and paddled the ones who acted up! 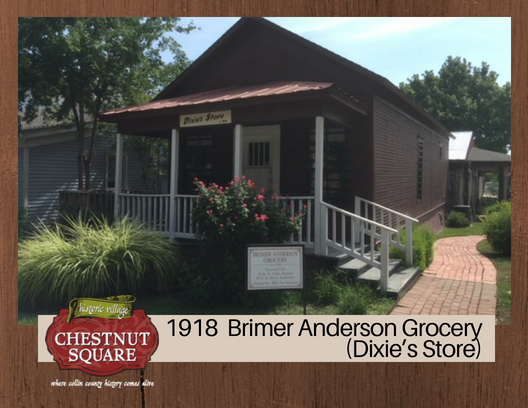 The store is the home of Doc & Clyde’s Ice Cream Freezer Museum, the largest collection in the world (Guinness Book of World Records). An Arts and Crafts bungalow, the house features wide porches and typical architectural detailing. The Bevel family lived in the house until 1975, then a 2007 fire rendered the home uninhabitable by the owners at the time. 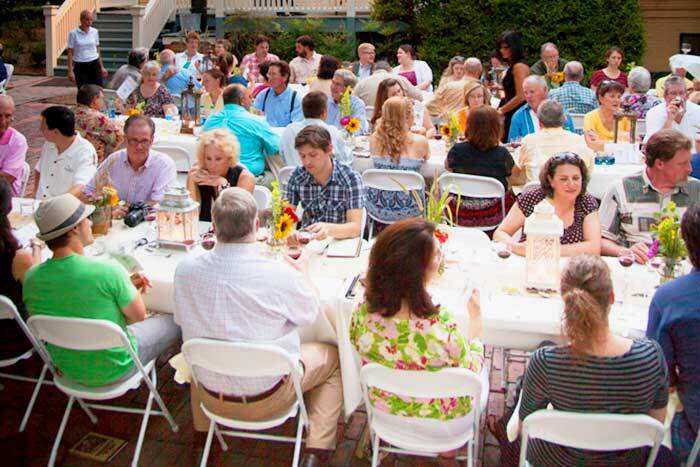 It was then purchased by the Guild, and completely preserved and renovated for use as a reception and event space.